When they they announced the return of Dragon Ball Z with Battle of Gods every fan would have bet we would see a flood of new DBZ merch including toys games and more toys. 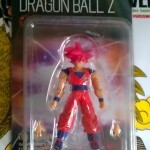 So far we have had hardly any toys of the new characters apart from the World Collection Figures and this Shodo Super Saiyan God Goku toy. The toy itself is maybe a little over two inches tall which sounds tiny but I think the reasoning behind it is these guys aren’t marketed as toys but Sweets with a free toy gift. I heard a rumor years ago that the reason toy companies released small toys like this with sweets was to get round payingtoy tax. The idea being that some countries have a higher tax to pay if your making toys. But if you sell a sweet which is in a lower tax bracket you can give a toy away for free. This making it a fairly expensive sweet with a free gift. To back this theory up there is a link on the back of the box to the Bandi Candy site. The toy also comes with a small piece of badly tasting bubble gum. 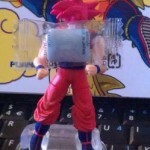 Saiyin that this has to be the coolest two inch toy i’ve ever seen. It has about twenty points of articulation including ball jointed feet and neck. It also comes with two sets of hands and a stand. 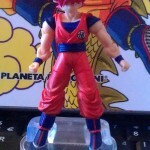 Paint wise it doesn’t have the mini detail and shading the Figuarts Goku does but it does have the symbols on his clothes front and back which is one piece of detail the Figuarts Goku missed out. To keep the tiny hands safe the stand opens up into two and has a little space to keep the spare set. Without that they would probably be lost within the day. 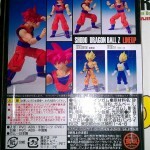 Price wise since it’s only available in Japan and it is the only official Super Saiyan God Goku figure he reaches prices of up o $60 online on sites like ebay. After a paitient few weeks of searching I managed to get this one for about $14 including shipping which I think it about right for this fiugre considering the size. Overall it’s a great little figure and is a highly reccomended perchase. 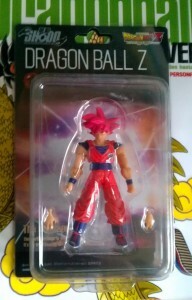 On the off chance that we don’t acutally get a new God Goku figure in then next year or so I can see this little guy being worth hundreds od $$$s in the future. The down side of this figure is his scale doesn’t let him match up with many other figures and he looks very lonley on my desk. I’d really love this figure if you could get a Birusu figure to go with him.